Leslie Perry is a true leader in Sonoma County and beyond. Mr. Perry has practiced law in Sonoma County since 1975. 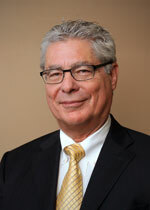 He is a founding partner of Perry, Johnson, Anderson, Miller & Moskowitz. In 2014 Mr. Perry was honored with the Careers of Distinctions Award from the Sonoma County Bar Association, and in 2015 selected to the Northern California Super Lawyers List. He is an AV Preeminent® Peer Review Rated attorney. Mr. Perry has had a number of reported cases including, Sundstrom v. County of Mendocino (1988) 202 Cal.App.3d 296.; Bowman v. City of Petaluma (1986) 185 Cal.App.3rd 1065; Gardner v. County of Sonoma (2003) 29 Cal.4th 990; Warm Springs Task Force v. Corps of Engineers;(1980) 621 F.2d 1017; Hines v. California Coastal Commission (2010) 186 Cal. App. 4th 830. Mr. Perry practices in the areas of land use, real estate, mortgage finance & structured products and business law. He represents clients before various administrative and planning agencies, including County of Sonoma, City of Santa Rosa, Town of Windsor, City of Petaluma, City of Rohnert Park, City of Sonoma, City of Cotati, City of Sebastopol, Sonoma County Airport Land Use Commission and Water Quality and Air Quality Boards. Mr. Perry also represents clients in general real estate, environmental and contractual litigation. He has significant experience with California Environmental Quality Act compliance and litigation. Besides Mr. Perry’s incredible achievements in his professional field he has gone above and beyond the call of duty to be a contributing member of our community. Mr. Perry currently is a member of the Board of Trustees of Memorial Hospital; a member of the Sonoma County Harvest Fair (past president); a member of Santa Rosa Mainstreet Board of Directors (past president); a member of Business Advisory Assessment District (vice-chairman); and a member of the Sonoma County Volunteer Center Board of Directors (past president). Mr. Perry was formerly a member of the Audubon Canyon Ranch Board of Directors; Sonoma County Planning Commissioner 1986-1995, Chairman 1987 and 1992; a member of the Sonoma County Emergency Medical Care Advisory Committee; Sonoma County Energy Advisory Committee; Northern Sonoma County Air Pollution Control Board; Sonoma County Civil Service Commission; member of the Board of Directors of Burbank Housing Development Corporation; Member of the Board of Director of the Sonoma County Fair (past president). And is a member of North Bay Leadership Council’s Board. Mr. Perry is admitted to practice in California, Ninth District Federal Court of Appeals and the United States Supreme Court.